Work through the presentational ugliness and technical awkwardness, and you’ll find an experience of frightening depth. In my time with Kenshi, I've crossed swamps so vast that I haven't dared return. I've been beaten shitless by a pack of goats that were intended to feed my rabble of listless nomads. I've been a shopkeeper and a thief, a lone wanderer and a slave, and I've been an entire community of people working together to—one day—erect our own city in the wasteland. One day. None of these events were part of questlines. 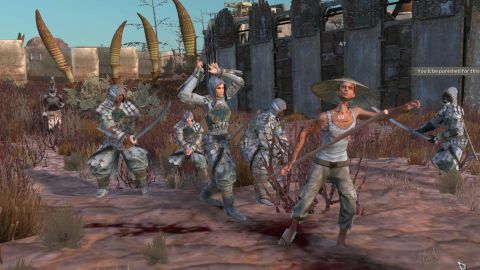 There’s no such regimentation in Kenshi, no tangible sense of scripted behaviour, just a ragged web of vicious systems so myriad that they sometimes tangle and fumble and descend into absurdity. But there is a cold order to Kenshi too, a formidable degree of depth that’s as impressive as it is stubborn. Upon creating your squad of up to six starting characters, you’re unceremoniously dumped into a dauntingly large post-apocalyptic world that looks like Mad Max were it set in feudal Japan. All of your skills start at or around zero, and you work on them simply by doing. There are no special abilities or spellcraft, and you’ll probably spend your first several hours as a lowly scavenger—sticking to the shadows, levelling up your stealth, and scurrying in after skirmishes between the various factions and fauna to loot the dead. Beyond that? Perhaps you search the wilderness for artefacts or lore titbits, hunt down bounties for the myriad factions, join up with anti-slavers, or just set up shop on a busy trade route and try to make an honest living. Through bar-crawling and chance encounters with escaped slaves and other vagabonds, you can recruit new people, who you then take control of just like your original characters. You can have several squads in different parts of the world if you wish, or train new members as farmers and labourers so that you can build a self-sustaining settlement. At this point, Kenshi becomes a surprisingly effective management game as you research technologies, construct buildings, and assign people long lists of automated tasks like mining, farming and construction. Settlements present their own dangers: out in the wilderness you’ll face bandit and animal attacks, while settling near cities may subject you to strict taxation and other regional rules (one theocratic faction actually makes it a punishable offence not to pray regularly). There are a few missions you can pick up by talking to people, but the best stories are those that emerge organically out of Kenshi’s systems. For instance, in the early game, my first companion and I we were beset by slavers, who took one of us captive while the other managed to escape. I licked my wounds, gathered myself, and took it upon myself to rescue my companion. After a good few hours of scavenging, I saved up enough money to hire a mercenary band. We raided the slave camp and rescued my comrade, but it didn’t end there, as his shaved-head-and-shackles look meant that slavers and authorities would identify him as an escapee and attempt to recapture him. So began a survival experience deep in a swampy wilderness while his bounty expired. There are so many little layers here that the narrative possibilities feel endless. Kenshi’s mechanics and UIs have an arcane MMO feel, which can get cumbersome as your group’s numbers grow. Combat is automated, though you can make minor tweaks like defensive postures, ranged attacks and play around with squad formations. Movement, meanwhile, is mouse-based, with the WSAD keys controlling the camera. While the streamlined combat is functional given how many people you can end up controlling, things can get pretty fiddly when you’re managing inventories, transferring items between 10 or more people, and trying to get your settlement running as efficiently as possible. The early going can be cruel; basic survival plans can be easily derailed by a city guard who plants drugs on you then demands money you don’t have, or by finding yourself deep in a region inhabited by vicious alien giraffes. It can all get a bit grindy too; it takes a long time before you can handle yourself in a fight, a long time to grow food, and a long time to get around. Even though Kenshi is capable of conjuring great scenarios to break up these anaemic stretches, it doesn’t lessen the slog. But after around 30 hours, I still feel like I’ve so much to uncover. I've still got to expand from a dustbowl community to a fortress; to send an expedition of battle-hardened warriors out into distant wilds while back at the township artisans and workers rake in profits thanks to the clockwork-like regimen I created. Kenshi is huge, amoral, and opaque enough that I'll be deciphering it it for a very long time.